I picked up my package this morning from Bee Weaver and went straight to Baab-Brock Farms to install. Last year, I had a heck of time getting the syrup can and queen cage removed from the package while wearing gloves. 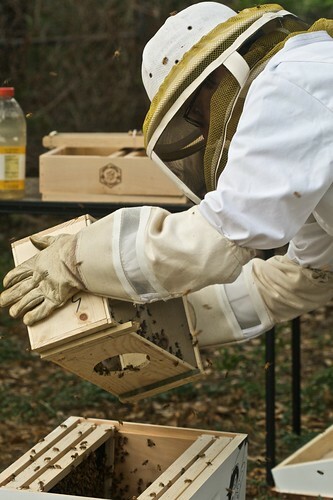 I opted not to wear gloves this year because bees are generally docile when they don’t have a home to defend. Here is a shot of my removing the cage before they had fun attacking my hand. After getting stung on my right and left hand, I put my gloves back on for the rest of the installation. 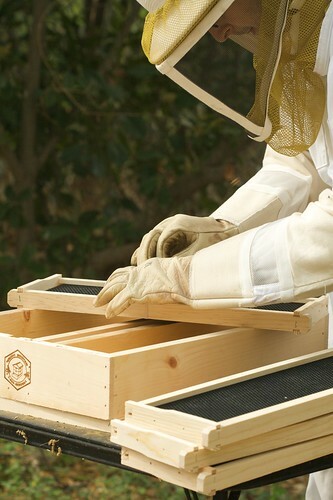 Here I am attaching the queen cage to a frame. 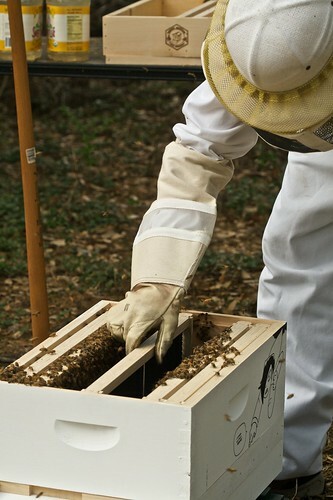 Next up was shaking the bees into the hive. 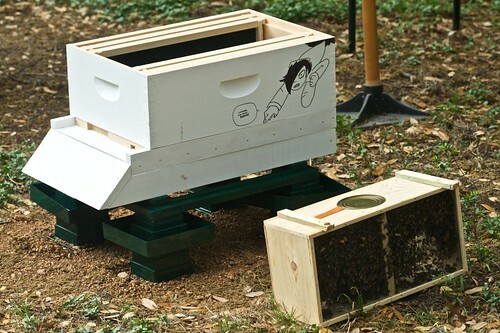 I then added the frames back into the hive. Now all eight frames are back in the hive and spaced properly. 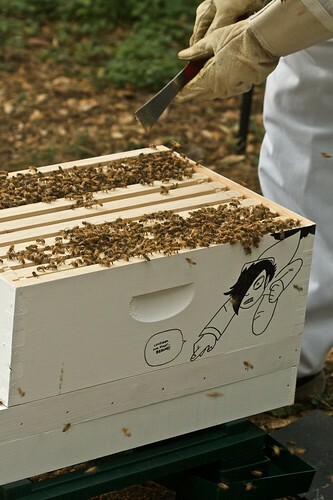 I placed the package at the entrance so any bees left in the box will find their way into the hive. All that was left was filling up the top feeder and closing the hive up. 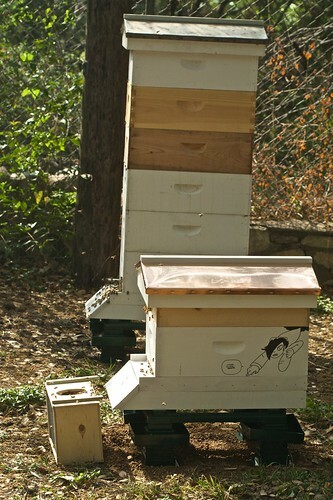 Here is a shot of both hives. Except for getting stung, it was a straight forward installation. I’ll come back mid-week to check the syrup level in the feeder and next weekend I’ll verify that Ramona has been released. 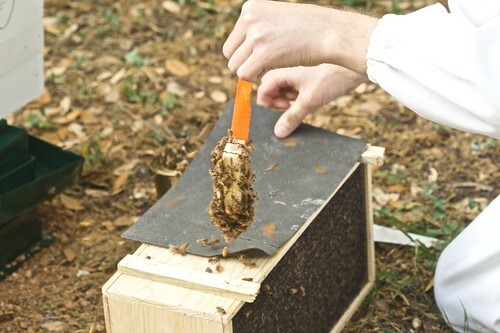 I am planning on installing a package of bees from Bee Weaver tonight. I am using the same setup as you in terms on the 8 frame medium supers. I was wondering how long you are going to wait to add another super to the hive and how many supers you will end up using for brood? A good rule of thumb is to wait until they have drawn out comb on 6 out of the 8 frames before adding another super. They will often times not fill out the frames in the 1st and 8th position so you can also move these in one position to encourage the girls to use all the frames. I had awful luck with a queen excluder and I’ve made the decision to not use them any more. I just keep adding supers as they need them. 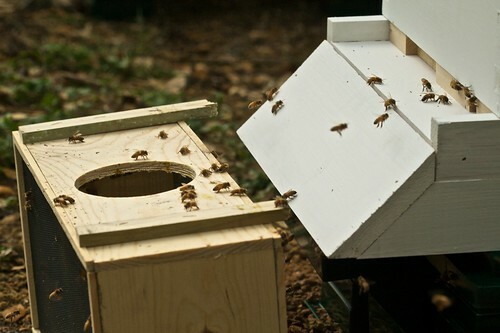 I found they naturally used some boxes for brood and kept others all honey.